The value and the marketability of an exchange through football have been recognized and are being held actively throughout the world. Among them, a friendly match has been considered as the most important factor and a variety of things can be achieved through this, such as improving team’s strategy, increasing active exchange between the countries or the teams and hosting charity events. The purpose of friendly matches is to help the teams. Especially, during the season before an international competition or the period of preparing a new season, the teams will compete with teams at a similar or better level like an official match. And this is to analyze the strengths and weak points of team and other hand it could consolidate and to complement their performance. The purpose of friendly matches is to help teams improving team’s strategy. Especially,during the season before an international competition or the period of preparing a new season. And this is to analyze the strengths and weak points of team and other hand it could consolidate and complement their performance. We have had a series of good friendly matches; we need to start seeing some benefits of those friendlies matches, seeing a more promising approach to our game is more than welcome. Otherwise last week performance is not inspiring any hope at all! First and foremost I would like to congratulate Chipolopolo for the stunning win at Levi Mwanawasa Stadium last Saturday; Am saying well done guys! The criticism that was imposed on the team prior to face Lesotho from the soccer fans was just okay. The funs know the potential of the Zambian team and if the team is not living according to its potential then funs have the right to come in and criticize it heavily. Wining a team with that margin is superb; I mean it’s very encouraging to the players as well us, the funs. But we should not get carry away that we’ve got it all. In all honesty we cannot make a solid conclusion that our team is strong in just one match. There is need to work extra hard and keep focusing. The team must always have in mind tougher opponents in the likes of Brazil, German, USA, Germany and other World Cup material teams in mind when preparing. I am saying this because we have hope and chance of qualifying to the world cup. Lesotho win is history now let’s forget it and focus on wining Sudan. It will be better to win this match by whatever margin but wining by a bigger margin will just add the needed confidence in our boys. Let’s approach the next game with all the seriousness and aggression it deserves. Then we can prepare to face Ghana to top the group as Ghana has all what it takes to qualify for the World Cup. We need to improve with our tactics, ball control and composure, set pieces, let’s also train our boys psychologically because at this stage it’s not only skill and having good tactics but psychological fitness is needed to be examined provided that the last game will be played away from home. Otherwise I strongly feel we have not got it all but we are on the right track keep working hard guys. 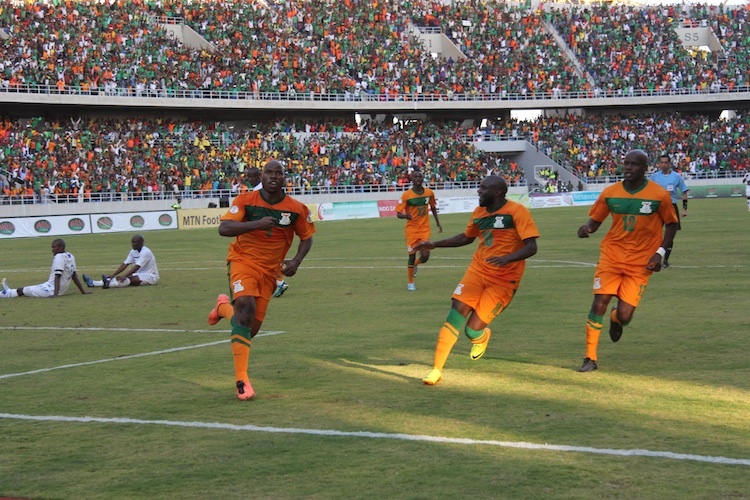 Zambia demolished Lesotho 4-0 to reclaim top slot in the Brazil 2014 World Cup Group D Qualifiers. In a game where more than four players are contenders for man of the match, Zambianfootball.co.zm takes a look at hoh the players fared. Danny Munyao-6.5-Did not look fazed coming in for suspended Kennedy Mweene. It helps that in 2007 the Red Arrows goalkeeper was at the World Youth Championship in Canada. Munyao was getting into company he was familiar with and territory chartered by his mind. He dealt with everything thrown at him comfortably. In the second half, he got down very well to stop a low shot. He even lifted his right leg in showmanship. Munyao was that at home. Davies Nkausu-6-The SuperSport Utd defender had a decent game. He was comfortable on the ball and superior in aerial tussles. Nkausu moved in front well too. He whipped in some wicked crosses in the Lesotho area. He looked what his potential demands. Chisamba Lungu-7.8-Again deployed as a makeshift left back but passed with flying colours. The Russia based showed his sultry skills. He started from the back. Drifted into midfield when need arose. He was tight in the tackle. Until, he has a place in midfield, no one will complain if Chisamba continues to thrive in defensive positions. This time he did not take eternity on the ball but used it well. He provided an assist with a pin-point cross that Chris Katongo nodded home for Zambia’s second. When Fwayo Tembo came on, it was party time down that left flank. Hichani Himoonde-6.5-He was the most experienced member of the back four. He mopped well. Himoonde’s criticism in the past was that he hides his deficiences in the injured Stophila Sunzu. But Himoonde despite not getting a lot of game time at his Congolese club Mazembe, showed he is his own man. Clinical both in the air and on the ground. Assured performance. Kondwani Mtonga-6.5-Converted from his holding role in his club football to central defence just like the newly enamored Sunzu he replaced. The Zesco Utd skipper gave a performance that left doubting pundits purring with satisfaction. He looked slow but commanding. Never really tested one on one, but Mtonga headed well, cleared his lines smartly and moved the ball upfield brilliantly. This performance will stand Mtonga in good stead against a much stronger Sudan. 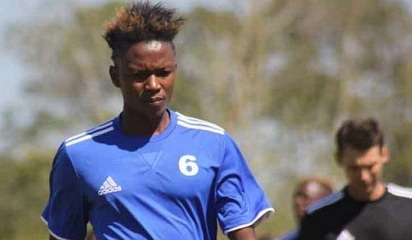 Nathan Sinkala-8.2-Every time Nathan Sinkala is given full marks comparisons with his more illustrious elder brother Andrew who turned out for European champions and treble winners Bayern Munich abound. Nathan has come out from the shadows of his Germany based sibling. It helps that Nathan comes from a family that breathes football. His dad Moffat Mutambo was a general of the game. Nathan was masterful here. His mixed it up. Guile, vision, sometimes keeping it simple but effective. Given that the opposition was limp, I may over exaggerate just how good Sinkala was, but he was superb. Mukuka Mulenga-8.5-my joint man of the match alongside Jacob Mulenga. Football was called the beautiful game because of its ability to thrill. Mulenga embodied that. He was exciting to watch. On the back foot, he looked tactically sound, on the front foot, Lesotho wished he the Power Dynamos play maker had not been born. He was a constant threat threading seamless passes and quick change of pace on two legs that looked like powered by subsided fuel. If scouts watching at Estadio de la Levy they could have fallen over each other scrambling for Mukuka’s signature particularly on his second half showing. Did somebody say Rainford Kalaba was missed? Mukuka is here. Chris Katongo-7.6-the captain’s best game in Chipolopolo colours since the 1-0 win over Ghana at this same stadium. He was lively through-out. No doubt Katongo has been a hardworker even when his performances have plummeted but this is the sort of performance that earned him the vote for 2012 Africa BBC player of the year. He scored an excellent header and set up the opening goal and was everywhere. If Chris had been playing like this no sane fan can call for his retirement. Keep the levels high Katongo! Collins Mbesuma-7-Not his best match. The Orlando Pirates born again striker is slim by his huge frame body structure and was full of endeavour without threatening as well as he can. He got a poacher’s goal with his left foot after a rebound from substitute James Chamanga’s excellent work. Moments later Mbesuma could have had a brace but planted the ball over the bar when it looked easier to hit the net on 87 minutes. Jacob Mulenga-8.5-definite most valuable player on the pitch. He was almost ostracized after the disastrous 2013 AfCON outing. When played in the centre-his favourite position-and not the flanks-Mulenga showed his quality. His first goal was classic. As good as a goal one can see anywhere in world football. The Utrecht star now the all-time Zambia goal scorer surpassing the great Kalusha Bwalya, received the ball from the ingenious Katongo. With his back leaning on the last Lesotho defender, Mulenga unleashed an unstoppable bicycle kick that flew in the net. The floodgates opened on forty minutes. The second was a good shot in the area in a melee. Doubter ate humble pie. Subbed late on but that hardly mattered, the lad coveted by Spanish La Liga teams had spoken on the pitch. Fwayo Tembo-7-The Romania based showed he can be and should have been a starter in this match. He litterally took over the right flank with strong movement and dribbling. It looked like Fwayo was given the freedom to frequent and bamboozle Lesotho. One can only fathom his impact had he had played from the first whistle. Fwayo is direct. The lethargic first half cried for players to take the game to Lesotho not making sideward passes and fluffing passes! Bornwell Mwape-too late to classify but had two good chances to write his name on the score sheet. A good move to play him even if it was a cameo. His confidence will soar. James Chamanga-7- in that one move that saw him round the keeper and rattle the post the China export showed he has plenty to offer yet. Even if I had expected to see Emmanuel Mayuka who is the future, and not Chamanga, who is nearing his past, the Lusaka groomed justified his selection. It was a tough one considering that Mayuka had arrived earlier in camp but Chamanga has been in a rich goal scoring form in China. Herve Renard-8-The Frenchman, Africa Cup winner 2012, eased pressure on himself after some indifferent run of results lately. This is win ranks among his best as Zambia boss. I was surprised with the cautious approach of playing the defensive minded Chivuta ahead of Tembo. The first half was not so good as a result-Renard. But credit for converting Mtonga. The former Ghana assistant coach-or physical trainer- is superb at this. He turned Sunzu into a world class defender. Not Mtonga is the next in line from the Frenchman’s factory. The subs were spot on this time. Now football is a pressure game. Criticism will come in the wake of poor results. Take it on the chin and respond with results like the 4-0 win over Lesotho. Even the very best in the business “Big Phil” Luis Scolari is lampooned in Brazil when the World Cup winner shows indecision in team selection and poor man-management. That is the nature of the game. Zambians love Renard and respect his getting the first and only major trophy in the Africa Cup. Let the high standards be maintained starting with Sudan this Saturday and then getting a result in Kumasi against Ghana. World Cup qualification is in within sight especially if Zambia plays as well as the second half against hapless and little Lesotho. The 43 year old Showed loads of love in training to players he retained in camp. That was cardinal. Moral was high. Not being austere all the time. Crucially, playing Jacob Mulenga in a central attacking position. That was the difference between the Afrisports groomed in Utrecht and Chipolopolo colours. It was like seeing Jacob Mulenga at Angola 2010. Let Renard smile a bit now. He did his job and Zambia is happy. Merci. Zambia national soccer team has been shaping up and intensified its training ahead of this weekend’s crunch encounter against Group D basement side Lesotho. But the perception in the Copperbelt headquarters Ndola City is different. Zimandolans as the people from the quiet Zambia’s third largest city are called is different. Rambling around from Broadway to President Avenue in town then to Itawa and Chifubu, and finally Kansenshi townships, one can notice the belief in most Chipolopolo faithful. The fans have been bubbling with confidence when asked to predict the final score line. “4-0 to Zambia,” was the response of a barber man earlier on Thursday morning. Another fan said, “Boss, It’s Levy Mwanawasa Stadium.” The atmosphere inside the Stadium is nothing compared to what the Lesotho players are used to. “For those who have watched games from that Stadium, they attest to the fact there’s a funny echo. And that will be the weapon because when we scream from the first to final whistle, they will think it’s 80,000 fans. I don’t know how the Chinese did on that echo but it makes the atmosphere incredible,” he added. Heading inside Shoprite, one is greeted to morale boasting songs. From Sakala brothers’ ‘Puteni Ichimwela’ song featuring the legendary commentator Dennis Liwewe to Mozegater’s ‘Are you ready boys? 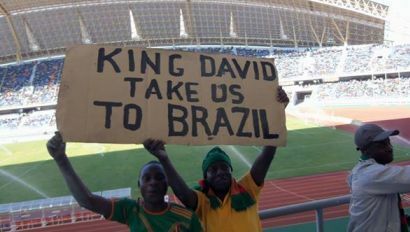 What about Tribal Cousins’ Chipolopolo 2000? And Mimbulu family’s Vuvuzela? They all played and one had to delay shopping and wondered around so that all the songs are played and luckily it ended with Kopala finest and their own Mark 2’s ‘Vikamo Ichimwela’ with the ‘feeling feeling’ instrumental. ‘Mu goal muli Ba Mwine ba Mweene……Kalaba talaba efimweba Renard.’ Unfortunately both Kennedy Mweene and Rainford Kalaba are out through suspension and injury respectively. After Shoprite, one jumps on a taxi and the man on the wheel predicts another emphatic victory but he is not too sure with what is happening in the goalkeeping department. “I hear Titima has been recalled but the other ones I don’t know them. And when asked about his preferred choice, the taxi driver responded, “I don’t know. For the goalkeepers, we are praying they do a good job. Then comes the prediction for the goal scorers, many as expected and if you are betting man, put your man on Collins Mbesuma. That’s the message from the host fans –Zimandola faithful. At this hour, It’s all systems go, full support and not time to point fingers or find faults. It’s Zambia’s maiden appearance at a FIFA World Cup at stake. Fans and all stakeholders have to be united and rally behind the Copper Bullets. While many international pundits have already earmarked the final Group D clash in Kumasi between the 2012 African Champions Zambia and the Black Stars of Ghana as the match to decide the destiny, it is this sort of matches which shape destiny. 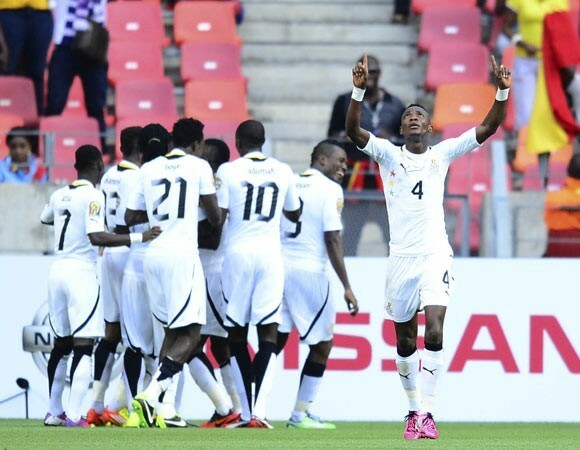 Ghana have a tricky tie away in Khartoum and the Sudanese are not pushovers at home. A draw in Khartoum and a win for Zambia tomorrow will be enough to keep the nation’s dream. Chipolopolo midfielder Rainford Kalaba this morning successfully underwent a Magnetic Resonance Imaging MRI scan on his injured right calf. Kalaba who has been ruled out of Saturday’s game due to injury was released from the national team camp to allow him travel to Lusaka to under go the scan so as to determine the extent of his injury. FAZ communications manager Eric Mwanza confirmed the development but could not give further details on the results of the scan. Kalaba has been out of action for over three weeks and it remains to be seen if he will recover in time for the Sudan game which will be played next week in Ndola. The petit midfielder who was voted as Africa’s second best player based in Africa is one of the 3 key Zambian players who will miss Saturday’s match. The other two are defence kingpin Stoppila Sunzu and shot stopper Kennedy Mweene who have both been ruled out due to injury and suspension respectively. 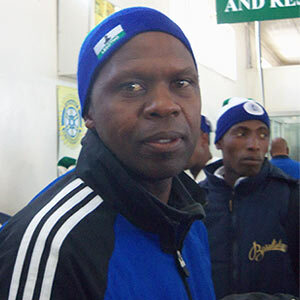 Lesotho coach Leslie Notsi believes his team is ready to claim a famous victory over Zambia this weekend to help Ghana in the 2014 World Cup qualifiers. The Crocodiles travel to face the Chipolopolo this Saturday in the crucial game in Ndola. Zambia desperately need a win to remain in pole position to pick the sole qualification slot in Group D.
The former African champions lead by just a point going into this weekend’s round of games. But Lesotho coach Notsi believes his team is ready to cause another major upset which will help Ghana who would have played against Sudan by the time Zambia lines up against Lesotho. “We are prepared for the game on Saturday and at the same time we are aware that it is going to be a tough encounter. But I believe my boys are physically and mentally ready for the game,” Notsi said. “Last Sunday we had an international friendly against South Africa which we lost but there are very good attributes that we got from the match. “Playing against Zambia is a motivation for us smaller upcoming footballing countries and because of that motivation we are here to win.